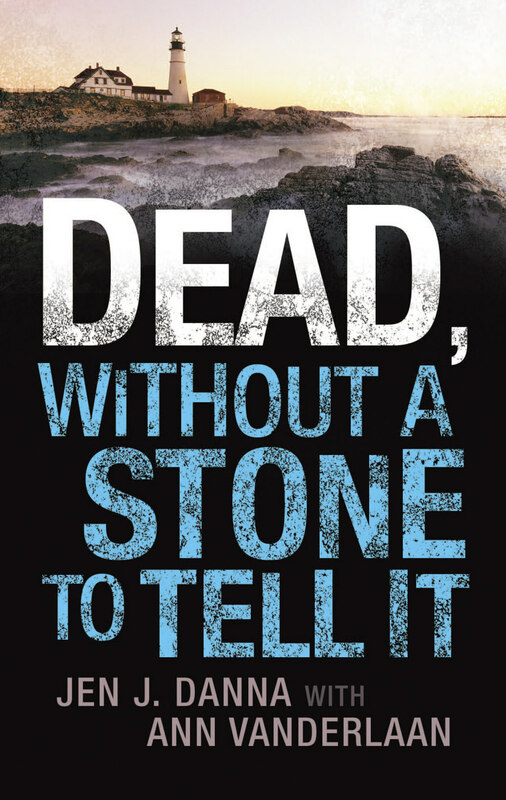 This week we’re continuing on with our series of posts on the background behind TWO PARTS BLOODY MURDER, out next week in both hardcover and eBook. Last week we talked about the reasons for Prohibition that led to the 18th Amendment to the Constitution to the United States. This week we’re going to look at the actual legislation and the considerable challenges this legislation raised regarding enforcement. We’re also going to share a few tidbits from the novel, in this case, trivia bits that come from the chapter titles that hold some fascinating pieces of information. The legislation behind the 18th Amendment was the Volstead Act, also called the National Prohibition Act. While the Amendment proper banned the production, storage, transportation or sale of intoxicating liquors, the Volstead act provided for its enforcement. According to the act, any beverage with greater than 0.5% alcohol was included. Of note, personal ownership of intoxicating beverages and actual consumption was not illegal. The sudden termination of sales of alcohol through legitimate business afforded the black market and the mob a huge opportunity. These were people who had no interest in obeying the law in the first place and realized the incredible potential for commerce. The government might not allow the sale of alcohol, but the truth of the matter was that people still wanted to drink and would go to great lengths to do so. As we showed in last week’s excerpt, people were willing to roll the dice and take their chances with death for the opportunity to escape the dreary reality of their Depression-era lives. It was also a well-known ‘secret’ that many within the realms of government, the same people who legislated the Volstead Act, were not willing to cease drinking themselves. But these were people who could afford to purchase safe—but incredibly expensive, black market alcohol—and had the connections to arrange the transaction. 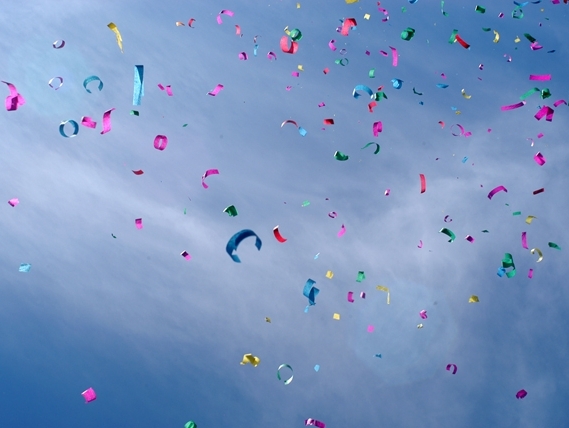 It was the poor, scrambling to find anything to fill the gap, who died in the attempt. Transgressions began as soon as the Volstead Act became law. The very first documented infringement occurred fifty-nine minutes after the Act became law when a train was robbed of $100,000 of ‘medicinal’ whiskey. Backdoor deals, violence, and robberies became the name of the game. Rival mobs would often try to steal from each other, and murder and crime rates soared. Gangsters like Chicago’s Al Capone first became rich on proceeds from their illegal activities and then became superstars in the public’s eye when they often used their ill-gotten gains to open soup kitchens for the starving and impoverished. A whole industry sprung up around the transport of international alcohols into the U.S. overland across borders from Canada and Mexico, and by water into any available port. Chapter Twelve: Izzy and Moe - a very effective team of Prohibition agents. While disguising themselves as vegetable vendors, gravediggers, streetcar conductors, fishermen, icemen, opera singers, and Democratic National Convention delegates, Isidor “Izzy” Einstein and his partner, Moe Smith, made 4,932 arrests and confiscated an estimated 5,000,000 bottles of illegal alcohol. 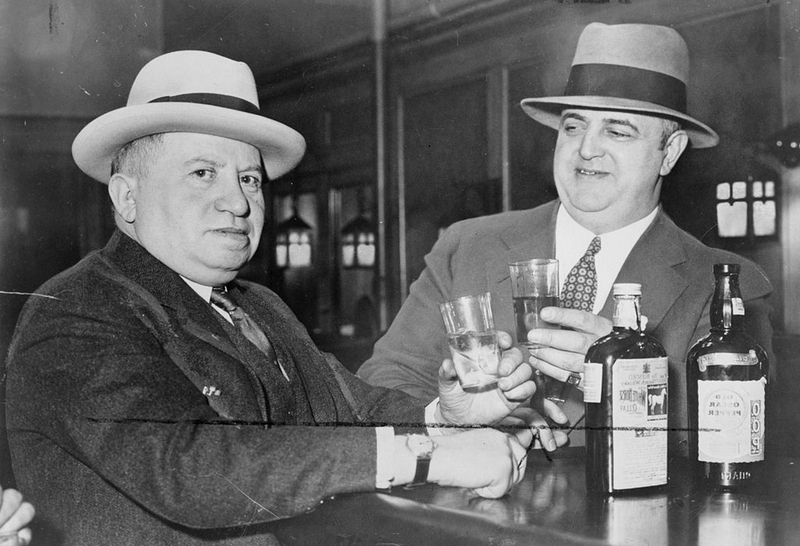 After a busy day rousting Prohibition scofflaws, Izzy and Moe liked to sit back and enjoy their favorite beverages—beer and cocktails. Chapter Five: Wine Bricks - a method to skirt the intent of the Eighteenth Amendment. Producing wine at home for personal consumption was not illegal during Prohibition. 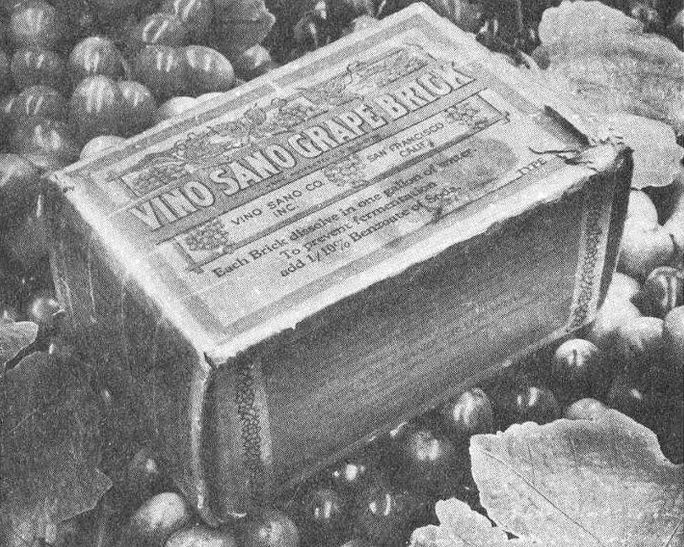 Wineries and vineyards dehydrated grape juice and compressed it into bricks. Buyers were reminded not to place the reconstituted juice in a cupboard for twenty days because it would ferment and turn into burgundy, sherry, claret, or some other type of wine. It was completely legal to make up to 200 gallons of in-home wine per year, and many took advantage of that loophole in the Act. Chapter Two: Blind Pig - an alternate name for a speakeasy. Possibly called a blind pig because the establishment turned a “blind eye” to Prohibition, or because consuming the often-contaminated illegal alcoholic beverages sold there sometimes caused blindness. 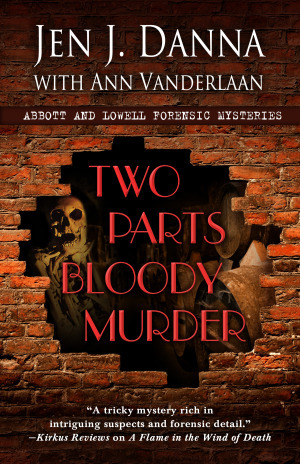 Throughout the month of February, we’re going to be previewing TWO PARTS BLOODY MURDER, which releases on February 18th in both hardcover and eBook. The history behind the story is fascinating. 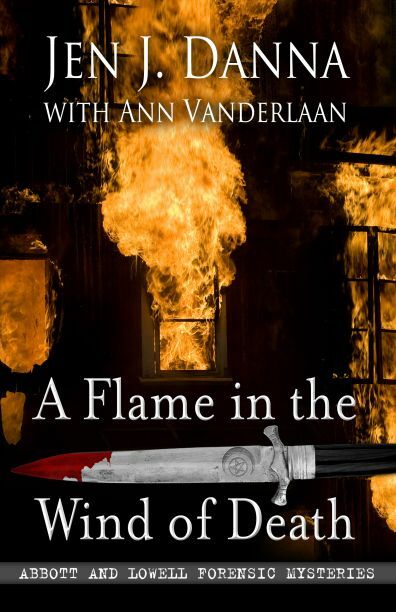 While set in modern day, the case is unexpectedly thrown against the backdrop of U.S. Prohibition which took place during the 1920s and 1930s. Prohibition was not strictly an American concept—it has, in fact, been enforced in many countries from Asia, Europe, South America, and Oceania. In North America, both the U.S. and Canada had Prohibition, but, Canada’s was never a national law. Instead, provinces instituted their own short-lived laws, and Prohibition was a thing of the past for Canada by the early 1920s—just about the time the U.S. was getting started. As a result, Canada became one of the pipelines of that fulfilled black-market needs. Since most North Americans only consider Prohibition to be an American phenomenon, and since that’s the background used for TWO PARTS BLOODY MURDER, that’s what we’re solely going to discuss over the next few weeks. What is Prohibition in the larger sense? Opposed to the commonly held belief, Prohibition did not outlaw the consumption of alcohol. Instead, Prohibition made it illegal to produce, store, transport or sell alcohol to the consumer, who was then legally free to drink it. Was it a universal law? There were exceptions to the law because alcohols were still used in some manufacturing processes (including dyes and fuels) and for religious rituals, while poisonous denatured or wood alcohol was used in scientific research. Why was Prohibition needed? Prohibition was a concept that came out of the Temperance movement in the U.S. which began in the 1820s. In its original form, temperance promoted moderation in alcohol consumption, especially in hard spirits, and while they encouraged abstinence from alcohol (called teetotalism), it was not a requirement. But as the years progressed, the movement shifted towards total abstinence, backed by legislation as required. The movement was mostly led by women, who along with their children, had suffered at the hands of husbands who drank away their paychecks or abused their families while drunk. They also claimed that ‘demon alcohol’ was responsible for poverty and destitution, crime, and ill health. When did Prohibition start? Several states made early attempts at legislation. Maine was the first state to ban alcohol in 1851 and it later served as a model for several other states. During the American Civil War, both the North and the South needed duty from alcohol sales to finance the war effort, so many states repealed those laws. Following, the Civil War, the temperance movement intensified, especially after the formation of the Anti-Saloon League. How was Prohibition legislated? Prohibition became federal law in the United States in 1920, mandated by the 18th Amendment to the Constitution of the United States. The legislation itself was called the Volstead Act. We’ll look into that in more detail next week as we also look into law enforcement’s challenge to enforce it. How was Prohibition ended? Despite all the good intentions that started Prohibition, it proved to be immensely unpopular and essentially impossible to enforce. On top of that, crime rates and urban violence soared as the Mob and other gangsters used the black-market to fill the gap previously filled by legal manufacturing. Corruption within law enforcement proved to be an ongoing problem that may have been the final nail in Prohibition’s coffin. 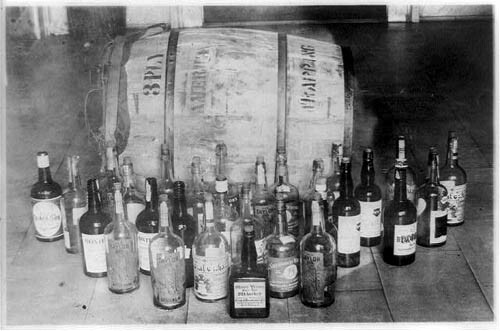 According to Chicago’s Chief of Police, an estimated 60% of his officers took part in the illegal bootlegging of alcohol. As a result, the 21st Amendment to the Constitution to the United States repealed the 18th Amendment. To this day, the 18th Amendment remains the only constitutional amendment to have ever been repealed. Leigh crossed the room toward them. “And once again, I didn’t expect to see you. You’re like a bad penny—you keep turning up,” she said to Rowe, returning his grin as he set the clavicle back into place. “I’m playing hooky.” Rowe raised a gloved finger to his lips. “Don’t tell.” He waggled bushy eyebrows at her and turned back to the remains. “It sounds awful.” Leigh wrinkled her nose in disgust. “People were that desperate for alcohol they’d drink poison?” Leigh asked. See you next week for our next bit of history—law enforcement during Prohibition.